Tolt is a gait that is on the forehand. The horse may feel light in front, but does that mean he's light on the front end? Light in hand, does not equal light in front. In my opinion, and from what I have learned over the years, there are two types of lightness -- one to do with responsiveness to the rider's aids (takes no pressure on the reins to get the horse to do thing, takes no real work from the seat or legs to get him to do other things) the other to do with the carriage of the horse. (the classically collected, light horse, that maintains himself in self carriage, raised back, lowered pelvis, arched neck, legs under body, weight shifted to the rear, with NO tension on the legs or reins -- ). A gaited horse can certainly get to the first ... even a horse that racks or paces can do that. And, IMHO< should indeed get there. In most gaits, they can't get to the second. I have played with Fox Trotters enough to get what might count as "first stage" lightness of carriage with them, but not achieved it with a running walk or a rack of any ilk. For horses in those gaits you can easily get a "sucking back" feel, that mimics lightness but is really a sort of constriction, not a raising of the back (bascule) lowered pelvis, leg under the horse sort of thing. I think this feel confuses people, and not knowing exactly what real collection/lightness is composed of, they assume that is what they have, because the horse isn't hauling on their arms and he seems to be lifting his front legs higher. Again, any horse in any gait can be light to the aids -- hands, legs. Most of the easy gaits do not lend themselves to lightness of carriage, however. I keep working toward it in Fox Trotters, and it is not easy, even with them. For more stuff on lightness, and in fact a whole world that is devoted to it, check out this website -- http://www.allege-ideal.com, the English version is available if you click on the British flag! What is "on the forehand"? 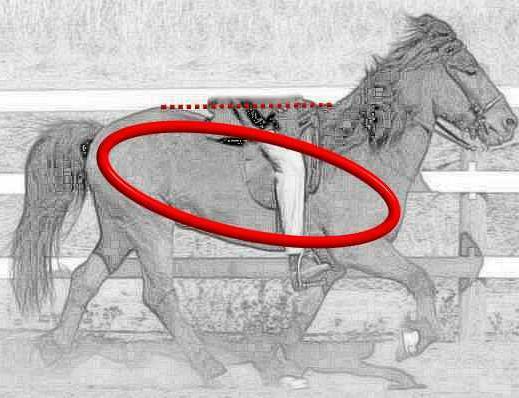 Activating the ring of muscles allows the horse to carry himself in a balanced position. Without activation of the ring, the horse is on the forehand. When the horse is light on the forehand, there will be increased angulation in the hips, hocks, and rear pasterns; and decreased angulation in the forelimbs, and the horse will be level (at least level, if not uphill) from the core of the loins to the base of the neck. Development of muscles in the neck are a sign of a horse that travels on the forehand: desireable complexus muscle is not evident, thin along the upper side, thick along the lower side; the lower triangle of the neck is hollow, combined with the muscling of the shoulder and arm. In tolt, the horse has not activated his ring of muscles, he does not have increased angulation in the hindquarters, and the signs (described above) of being on the forehand are evident in the horse's body. Horses in lower levels of training, who have not yet learned to balance themselves in self carriage are said to be on the forehand. Totally off balance - On the forehand, looking for support in the rider's hand. In natural balance - On the forehand. In balance - Equal weight on all four legs. Collection - Majority of its weight on the hind legs. In lightness, looking at the horse from the side, the shoulders will appear higher than the hindquarters. When the shoulders are lower, the horse is heavy on the forehand, out of balance. In addition to the above visual aids to see if a horse is on the forehand, you can also measure the groin depth vs. the girth depth. 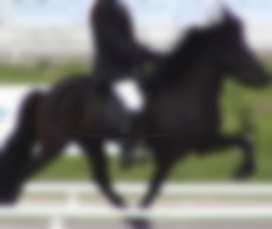 A small groin depth can indicate a horse that works on the forehand, rather than in lightness. Working in lightness, engaging the ring of muscles will built up the groin depth. The descent of the pastern is also a visual aid in determing if a horse is on the forehand. Compare the working descent of the pastern to the angle of the standing pastern. One way to look at this is to blur an image of a horse in tolt. This will enable us to see whether the horse's body, in general, is pointed up or down. Another idea from Mary Wanless is a suggestion to look at the horse as if his legs were cut off... would he fall down in the front or on his hind?